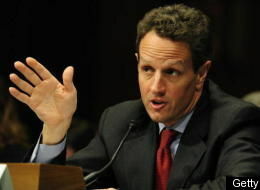 Geithner: Global Financial Crisis "Still Evolving"
Crisis is "still evolving"? Thank you Christopher Columbus. "They (the G20) aren't waiting patiently. Brazilian Finance Minister Guido Mantega said there is an "urgency" for the U.S. to solve its banking problem. "If they're going to be nationalized then go ahead, if they are going to be liquidated then go ahead. But it must be done quickly," he said after the Saturday meeting." I have written and said a thousand times - just get on with it. Do something.